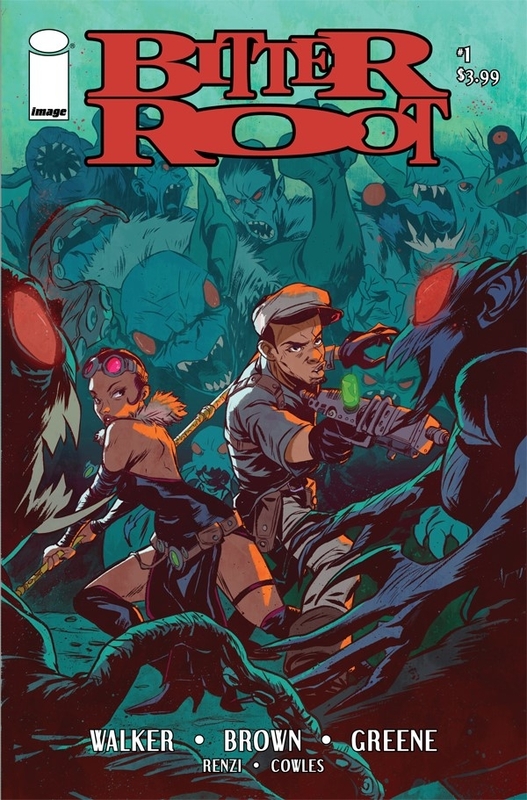 Bitter Root #1 review: Nipping racism in the bud – AiPT! Despite this issue being about a family of monster hunters, this has a weighty cultural agenda that’s more important than ever. In the back of Bitter Root #1 is a mini-essay written by John Jennings (Professor of Media and Cultural Studies at the University of California at Riverside) where he surmises that “The three creators of this series were tapping into the same allegorical power that previous black creators have when dealing with race and social justice.” Despite this issue being about a family of monster hunters, it has a weighty cultural agenda that’s more important than ever. Though, I do think the allegory is a bit muddled. The creative team behind Power Man and Iron Fist have teamed up with Chuck Brown to tell a story taking place in 1920s Harlem, where an African-American family, the Sangerye, fight off corruptive demons called the Jinoo, who turn white people into vicious horned monsters. In case it wasn’t evident enough already, this threat is an allegory for racism. There are other elements that are obvious from a trope perspective, but the issue has a big heart that garners enough good will to overcome some bumps. Allegories can oftentimes be muddled. There is a case to be made that the Jinoo are a slightly confusing element. While the idea of a black family stopping rampaging monsters of hate and returning them to normal is a great premise, the exact specifics are vague. This issue mixes two types of hatred: real-world, historically based and fantastical. This brings up a host of questions. Can the Jinoo infect any random white person, or only racist ones? If so, isn’t it reductive to have just a needle “take away the racism” if the Jinoo is a partial stand-in for the affliction? On the other hand, the Klan shows up later. Why aren’t they Jinoos? Racist police work makes an appearance, but these officers are then attacked by a Jinoo. Why would these hateful beings attack their own? In terms of character work, the cast has very broad archetypes. Cullen is the nerd, Berg is the intellectual (using words like “sagacious” and “heuristic”) and Ma thinks that Blink should just do woman’s work and not be a fighter like the men (even though she’s better than them at it). No, it’s not subtle, but it’s charming and effective. It’s not uncommon for first issues of a new series to make broader strokes in the beginning, laying the groundwork for more nuance to come. There’s also a Doctor Sylvester and his assistant, Miss Knightsdale, who appear to be the antagonists. Compared to the heroes, though, they don’t have the same level of personality and are less memorable. Sanford Greene’s art is wonderfully vibrant and expressive, especially with additional color work by Rico Renzi. Most of this issue has a brilliant violet palette melded with pinks and reds. This gives us fantastic atmosphere, whether we’re in a crowded club of the rooftops or Harlem at dusk. Greene not only delivers dynamic character action and designs, but also a vast array of expression for the cast. Yes, his style is very cartoony. That doesn’t mean, however, that it can’t convey boatloads of nuance that builds character. The setting of Harlem in the roaring ’20s is a fascinating one. Although I would have preferred to see the heroes interacting with their historical setting more, first issues have a lot of heavy lifting to do already, and I have no doubt the time period will factor in more as the series progresses. Those who enjoyed the racist-busting shenanigans of BlacKkKlansman and Sorry to Bother You will get a kick out of this messy yet exciting inaugural issue that has no shortage of ambition and heart. Those who enjoyed the racist-busting shenanigans of BlacKkKlansman and Sorry to Bother You will get a kick out of this messy yet exciting inaugural issue that has no shortage of ambition and heart.